How to Do Neat Mini Twists Video! 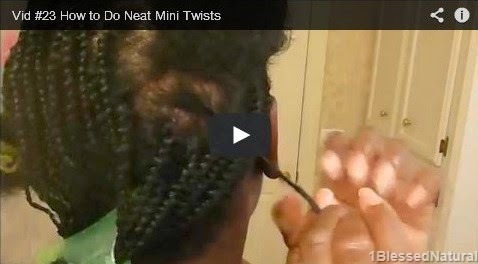 I've just uploaded a new video called "How to Do Neat Mini Twists" on my YouTube channel. The video is a tutorial on how I do my mini two-strand twists. I also included the products I use on my hair. If you are not able to view the video below, please click the link. Do you do mini twists? Don't forget to enter 1BlessedNatural's 2014 Christmas Giveaway!